As the VP of Enterprise Strategy, Michael is responsible for driving the rapid scaling of our Enterprise business. This article was co-written with Jon Younger, Founder of the Agile Talent Collaborative. One of the dominant trends in society over the past five years, and certainly in business, is the “gig economy”. Companies like Uber, Fiverr, Instacart, 99Designs, and TaskRabbit allow people from all over the world to provide on-demand services in a wide range of areas, from driving people to the grocery store to designing someone’s next book cover. There is no debating the impact these platforms have had on the way we live and work. It took Uber only five years to disrupt a taxi industry that dates back to the 17th century, deploy over 1 million drivers in over 300 cities, and log its billionth ride. Numerous studies and articles highlight the growth of freelance, or “gig” work, from McKinsey, who estimates that up to 162 million people in the U.S. and EU-15 currently engage in independent work, to Forbes, who suggest that 50% of the U.S. workforce will be freelancers by 2020. The companies driving the Gig Economy celebrate the benefits - flexibility, additional income, freedom, access to opportunity for workers, and ease of use for customers. Conversely, there has been a significant amount of coverage on the challenges presented by the Gig Economy, including lack of stability, downward wage pressure, limited opportunity, and a hollowing-out of the employment prospects for workers. While there is certainly cause for debate with respect to the impact of lower-wage, commoditized Gig Economy offerings, are these things true for all independent work? Is a lack of stability in employment a result of the Gig Economy and the platforms driving this shift in work, or are the platforms responding to a general shift in the nature of employment, where employers can no longer guarantee lifetime employment, and employees can no longer expect it? Lost in the discussion is a deeper understanding of the root causes of this shift, as well as a distinction in the types of independent work that people engage in. The situation of an A-list Hollywood actor is not the same as an Uber driver, and a student working 15 hours a week making Instacart deliveries is not the same as an independent consultant helping a Fortune 500 company take advantage of a new technology. We suggest that there are actually two “gig economies” - the Gig Economy, where work is commoditized and the platform is the differentiator, and the Talent Economy, where the talent is the differentiator and the platform is an enabler. In the Gig Economy, customers are provided with on-demand access to broadly available and undifferentiated services - the ease of access and low cost is the differentiator, not necessarily the individual who provides the service. 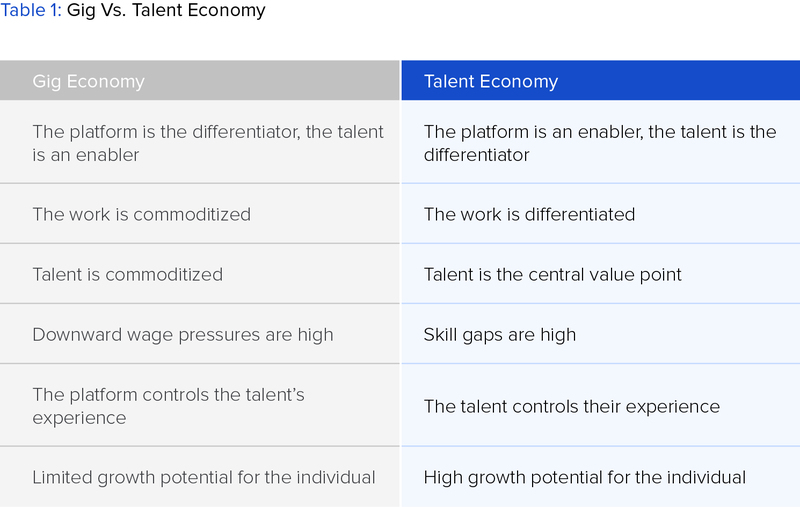 In the Talent Economy, the customer is actually buying the skill and expertise of the Talent - the platform is merely a “market maker” to paraphrase Arun Sundararajan and other pundits, that reduces the inefficiency of traditional employment and staffing markets, and enables the discovery of talent that is otherwise invisible to the customer. One topic that is even more frequently discussed and written about than the Gig Economy, especially in business circles, is the talent gap. Several studies, including those by PwC and Capgemini (along with our own research), have identified the ability to find the right talent as a key business risk. We recently surveyed over 1,000 business leaders and managers around the world and asked them to list the primary drivers for engaging non-employee talent to work with their internal teams. The top three reasons were flexibility, access to expertise, and speed - cost was a distant fourth. A survey by Deloitte in 2014 found that 51% of executives surveyed expected the use of contingent (agile) talent to increase in the next 3-5 years. Our own survey in 2017 saw that number jump to over 76%. There is no doubt that executive confidence in the durability of the talent economy side of gigging continues to grow across geographies and industries. This makes evident sense. The pace of change in business and technology is unrelenting, and the range of talent needed by an organization - the specific skills, capacity, and experience - changes weekly, if not daily, while the competition for in-demand skills grows ever more intense. With a more efficient market for talent, companies are able to build teams with exactly the right talent they need, exactly when they need it. Talent, in turn, are more able to find the best opportunities for them and their career, based on what is most important to them at that time (flexibility, opportunity, income, ability to work remotely, etc.). The pace of change in business is requiring teams to form with greater pace, as well as adjust more repeatedly, all of which is putting pressure on traditional hiring and talent acquisition mechanisms. The Gig Economy, through the commoditization of certain services, is making it easier and more cost-effective to obtain commoditized services more quickly, but it does not do an effective job at providing a platform for organizations to obtain highly-skilled, differentiated talent and services. For highly-skilled talent, the same “gig” concepts are being applied, but with very different impacts on workers, and for very different reasons. In the Talent Economy, people with in-demand skills and capabilities can unlock opportunities from around the world, and organizations can quickly and easily build the teams they need to compete in a dynamic global economy. In our recent survey, we also asked the same group of business leaders to identify the important factors in engaging outside talent - the quality of the talent was the most important driver by far, almost twice as important as cost. This suggests that in the Talent Economy, businesses are looking for the best people, not the cheapest. As a result, rather than be limited to a small number of opportunities that are right in front of them, talented individuals will be able to make themselves available to a much larger range of opportunities, both locally and globally. With more choice, they will be able to optimize against the considerations that are most important to them - flexibility, compensation, skill building, or the opportunity to work on a particularly interesting project. But what about stability? As the Talent Economy takes hold, and the marketplace for talent becomes deeper and more efficient, it could actually bring more stability to talent, especially talent with more valuable skills. Rather than being reliant on a single company, or in the case of consultants, a single consulting firm, talent will have access to a much wider range of work, which in turn, drives stability. Certainly, laws and regulations will need to change to support talented workers in this new model, and we will need to rethink many traditional support structures. But the ability to build teams of highly skilled workers when required, and the ability for talented workers to choose from a wide range of opportunities, is an emerging trend that could provide significant benefit to all involved, if done correctly. Basic economic theory tells us that when something in a marketplace is not differentiated, it becomes commoditized, where cost is the primary decision-making factor. This will inevitably push down the price of that commodity in that particular marketplace. We could certainly debate whether an Uber driver or Instacart delivery person is providing a commoditized service to those platforms, but either way, the marketplace is treating those services as such, because they are driving the price of the labor powering those services downward. But is that also the case with software engineers, data scientists, machine learning specialists, finance professionals, or cinematographers? Is there a difference between two software engineers, and the value they provide an organization? Our research and experience demonstrate that there is a difference, and when the value point in a market is highly differentiated and in-demand, prices rise, especially for the best. As a result, the Talent Economy may be the end of traditional employment, but that won’t be a bad thing, for the talent that powers it, or for the organizations that benefit from engaging the best talent. While they are similar in some respects, there are distinct differences between the Gig Economy and the Talent Economy - and their impacts on individuals, businesses, and society. As we noted earlier, the Talent Economy offers organizations access to highly skilled talent (a crucial problem for employers), and differentiated work, high growth potential, and control for workers - all the employee benefits that appear non-existent in the commoditized work currently driving the Gig Economy. With this offering, it will come as no surprise when more highly-skilled professionals turn to agile work. As such, this will have a profound impact on how organizations discover talent and build teams, and how skilled individuals find opportunities.